In August 2016, a trial excavation was conducted in a parking lot adjacent to Wasset Junction in the Golan Heights (Permit No. A-7783; map ref. 268715–62/782719–41; Fig. 1), prior to development work. The excavation, undertaken on behalf of the Israel Antiquities Authority and financed by the Jewish National Fund, was directed by R. Assis (field photography), with the assistance of Y. Yaʽaqobi (administration), R. Liran and R. Mishayev (surveying and drafting), E. Bron and O. Zingboym (ceramics), L. Porat (pottery restoration), H. Tahan-Rosen (pottery drawing), N. Zak (plans) and laborers from Tiberias. G. Jaffe conducted preliminary inspections at the site prior to the excavation. 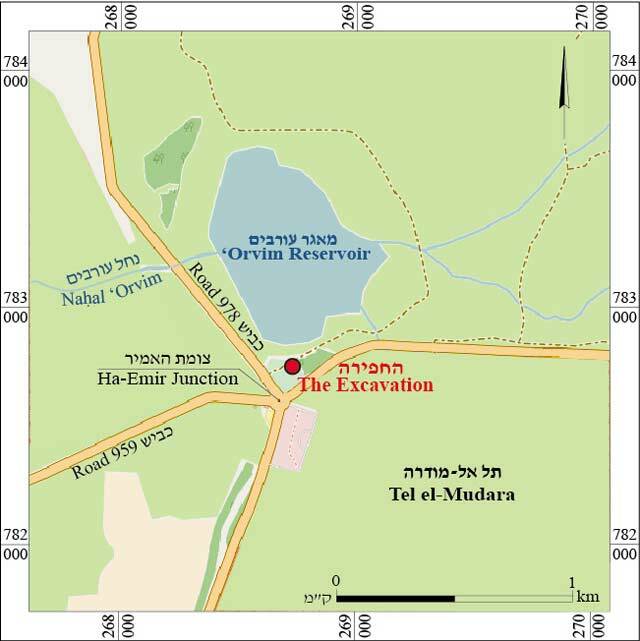 The excavation area (c. 60 sq m; Fig. 2) extended over a small mound, c. 200 m west of the summer palace of Emir Mahmud el-Faghur, sheikh of the el-Fadl Bedouin tribe that settled there in the nineteenth century CE. Two phases of an Iturean settlement from the Roman period (Strata IIA, IIB; first century BCE – fourth century CE) were discovered, above which were the remains of the Arab village from the Late Ottoman period and the Syrian rule over the Golan Heights (Stratum I; nineteenth–twentieth centuries CE). The excavation did not reach bedrock. 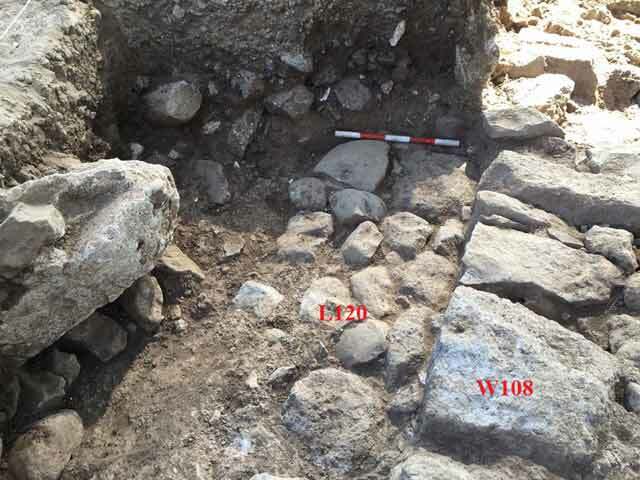 In a survey conducted in 2014, remains of a ruin from the Ottoman period were documented around the emir’s palace, and Iturean pottery sherds from the Roman period were collected between the road and ‘Orvim Reservoir (License No. S-488/2014; O. Zingboym, pers. comm.). In 2006 architectural remains bearing Iturean characteristics dating from the Roman period, pottery sherds from the Early Bronze Age and fragments of Iturean vessels from the Hellenistic and Roman periods were exposed on the small mound, c. 25 m northeast of the current excavation (Bron 2007). Stratum IIa. A wall (W106; preserved length 3 m; Fig. 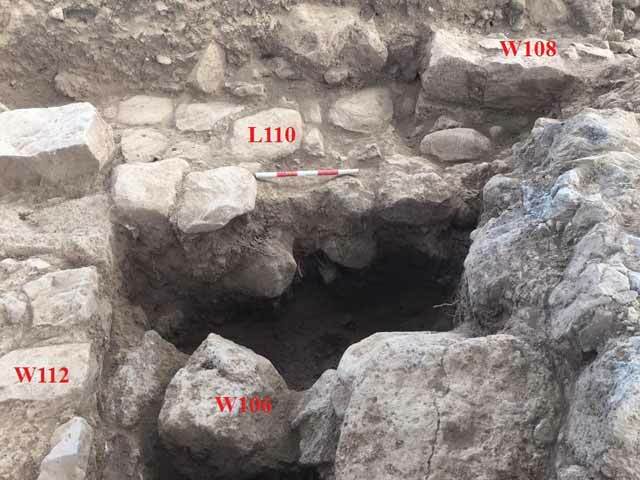 3) and a basalt floor (L119) adjoining the wall from the north were ascribed to the early phase of the settlement. Wall 106 was constructed of two rows of small basalt fieldstones with their flat side facing outward; the wall was partly destroyed. 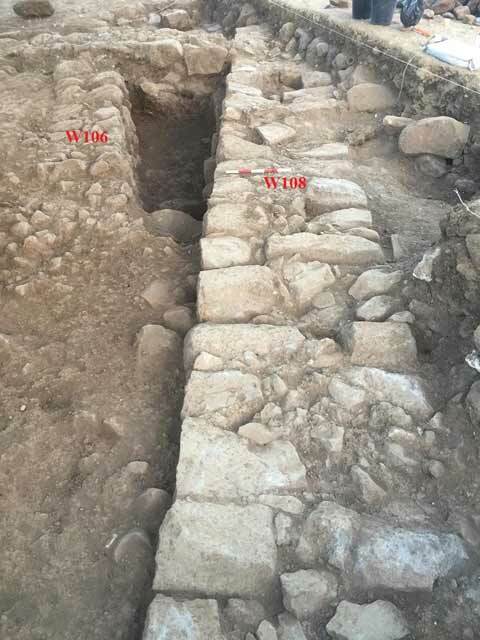 The foundation of the wall, which was built of large basalt stones, and the wall’s foundation trench were also revealed. Floor 119 was founded on a soil fill (L115). Fragments of pottery vessels characteristic of the Iturean culture, dating from the Early Roman period (first century BCE – first century CE), were discovered in the excavation. 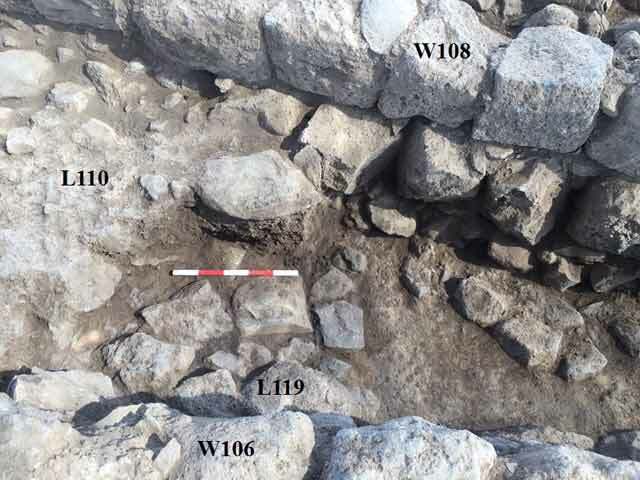 In a previous excavation, remains of a wall (W102; Bron 2007) built in a similar manner as W106, exposed in the current excavation, were discovered slightly to the northeast. It is therefore possible that the two walls were originally part of the same structure. Stratum IIb. Two new walls (W108, W112; Figs. 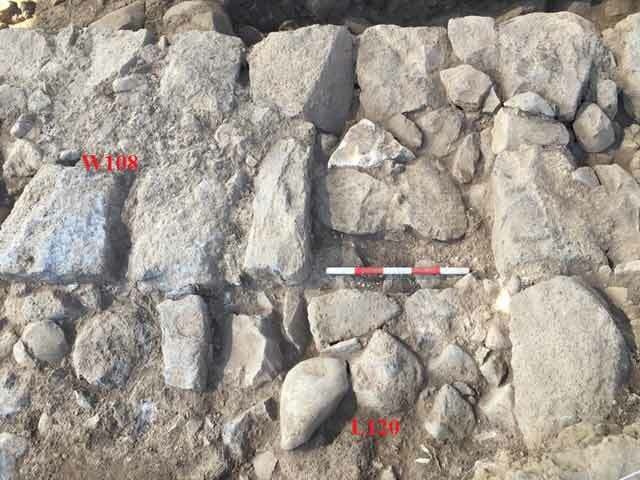 4, 5) abutted by two basalt floors (L110, L120) were discovered in the later phase of the settlement. In addition, a section of W106 from the early phase was reused. Walls 108 and 112 were well-built of two rows of large, roughly hewn basalt stones. Wall 112 was built on the foundation of W106. Floor 110 abutted W108 from the south and W112 from the east, while Floor 120 abutted W108 from the north (Fig. 6). Floor 110 was installed on top of a soil fill that sealed Floor 119 of Stratum IIA (Fig. 7). A narrow opening was fixed in W108 (Fig. 8); Floor 120 extended into the opening in the wall. The area between the eastern end of W106 and W108 was apparently blocked by a stone wall, which later collapsed (L118; Fig. 9). Wall 108 fell to the south with such intensity that its stones were mixed with the pavers of Floor 110. Numerous pottery sherds characteristic of the Iturean culture and dating from the Roman period (second–fifth centuries CE; Hartal 2006:11, 176–185) were discovered between the stones of Floor 110 and the collapsed rubble of W108 and in the area delimited by Walls 106, 108 and 112. Among these were many pithoi typical of the Iturean culture in the Golan during the Roman period; it seems that these pithoi were embedded in Floor 110. 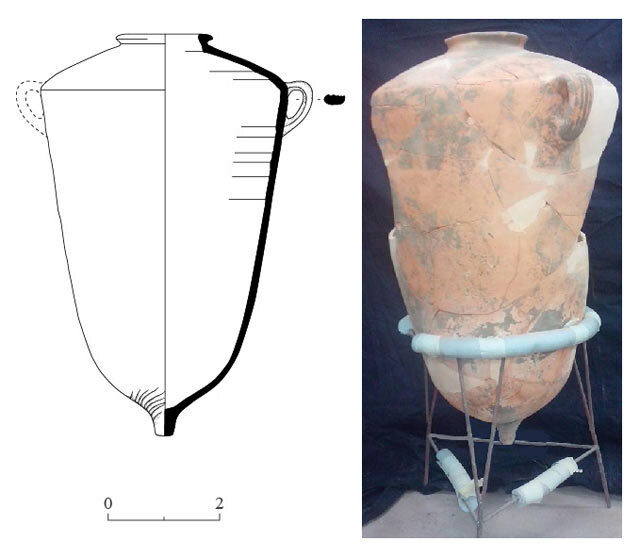 A broken though entire pithos was discovered in situ, which was subsequently restored (Fig. 10). 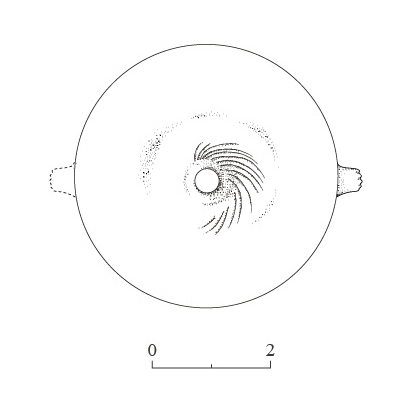 The pithos fragments included six identical bases, some of which have spiral knife-paring on the inside (Fig. 11), as well as hundreds of body sherds (Fig. 12:8). 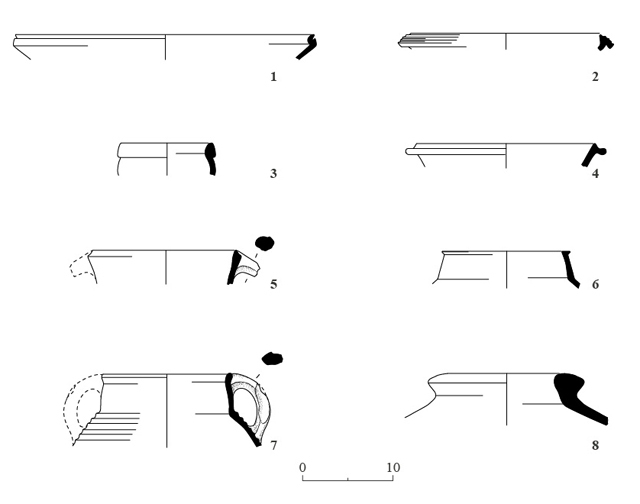 Other pottery sherds found in the area enclosed by Walls 106, 108 and 112 belong to bowls (Fig. 12:1, 2), a cup (Fig. 12:3), casseroles (Fig. 12:4, 5) and cooking pots (Fig. 12:6, 7). It seems that the architectural remains from this phase were part of a single structure, in which W108 was the outer, southern wall. The narrow opening in W108 probably led to a small room that was delimited by Walls 106, 108 and 112. Judging by the ceramic finds, the room held storage vessels, serving dishes and cooking utensils. This small room may have been a pantry where food was stored in pithoi alongside the various pottery vessels. Stratum I. The ruins of an Arab village were discerned on the surface near the excavation area. Two stone walls (W102, W104; Fig. 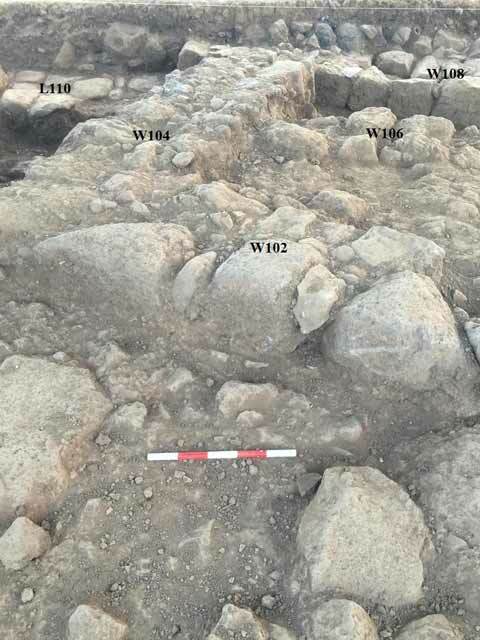 13) forming a right-angled corner were discovered in the excavation area. 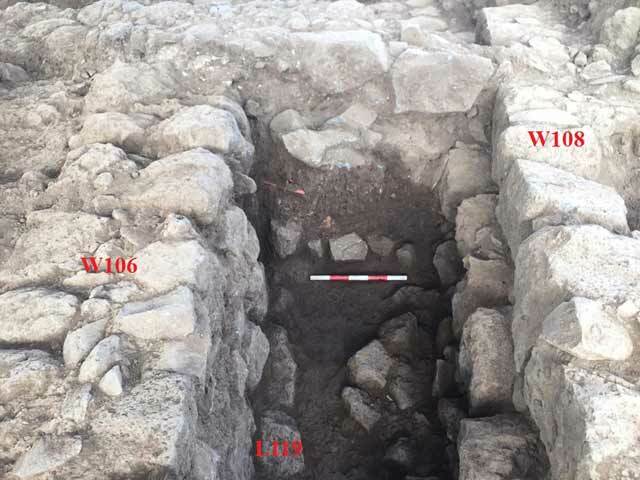 A soil accumulation found alongside the walls included dozens of nails used to shoe horses and three horseshoes from the late Ottoman period (nineteenth–twentieth centuries CE). 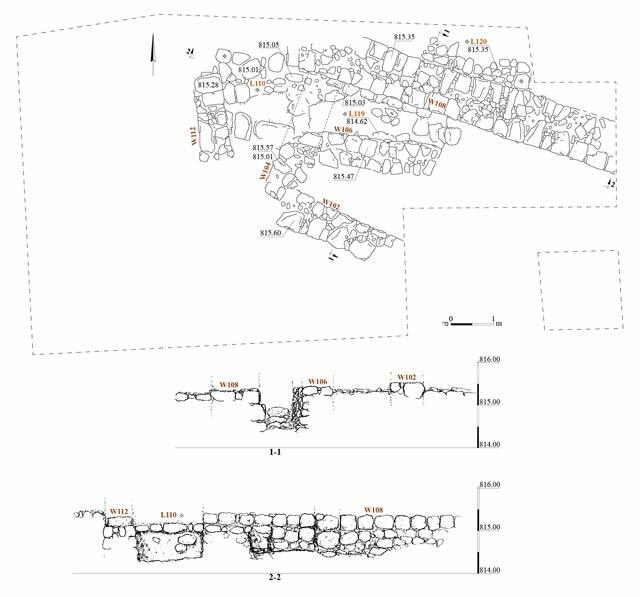 The northern part of W104 sealed the fragments of the whole pithos from Stratum IIb. While removing the northern part of W104, a button decorated with a pentagonal star, which was part of a Syrian military uniform, and a modern glass marble were discovered inside the wall. The Itureans settled in the northern Golan, and towards the end of the Hellenistic period they gradually switched from a nomadic existence to a sedentary life in permanent settlements (Hartal 2006). 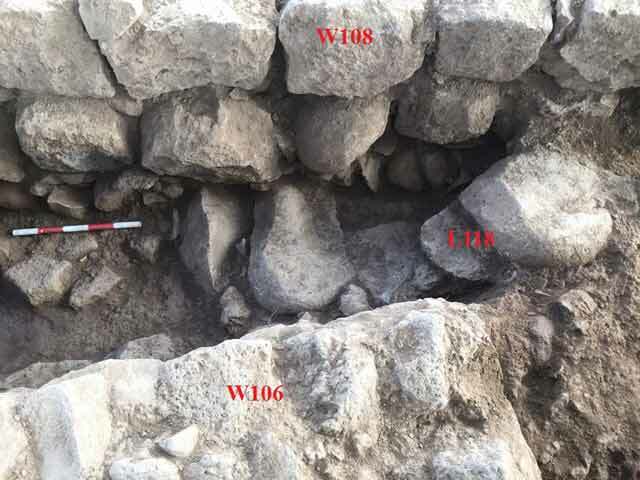 Wall 106 from Stratum IIA of the Early Roman period, which utilized unworked stones, and the wall from the nearby excavation may be evidence of this transition phase. The Stratum IIB building with the pantry dates from the second–fifth centuries CE as evident by the large amount of ceramic finds it contained. The absence of Byzantine period sherds shows that the site was abandoned prior to the end of the Roman period. The finds in the excavation are indicative of a permanent Iturean settlement that existed for several centuries during the Roman period. After the settlement was abandoned toward the end of the Roman period, the site remained deserted until an Arab village was established by Emir Mahmud el-Faghur of the el-Fadl tribe in the nineteenth century CE. Bron H. 2007. Wasset. HA-ESI 119. Hartal M. 2006. Land of the Ituraeans: Archaeology and History of the Northern Golan in the Hellenistic, Roman and Byzantine Periods (Golan Studies 2). Qazrin (Hebrew). 3. Wall 106 and Pavement 119, looking west. 4. Walls 106 and 108, looking northwest. 5. Floor 110 abutting W108 and W112, looking north. 6. Floor 120 abutting W108, looking east. 7. Floor 110, which abuts W108, and Floor 119 below it, which abuts W106, looking northwest. 8. A narrow doorway in W108, looking southwest. 9. Collapsed stones (L118), looking north. 10. A pithos after restoration. 11. The bottom of a pithos with spiral knife-paring, characteristic of the Iturean culture in the Golan during the Roman period. 13. Walls 102 and 104, looking north.